Here is the official team photo. Best quality I could find which is absolutely horrible. Last edited by memoryhole on Sat May 12, 2018 2:41 am, edited 1 time in total. Your images are blocked for me, memoryhole. Can you please save them to your computer and reupload them instead of using a Google search as a link? hoi.polloi » May 12th, 2018, 2:35 am wrote: Your images are blocked for me, memoryhole. Can you please save them to your computer and reupload them instead of using a Google search as a link? Thank you Hoi, I've changed the post to URL links with originals. I'm not sure if I'm doing something wrong or I need to use some other photo hosting service instead of Google Photos. In regards to re-uploading the images, I might be missing something as I don't have an upload attachment tab like the one in your previously posted screenshot. From what you know are these supposed to be the same team in both photos? 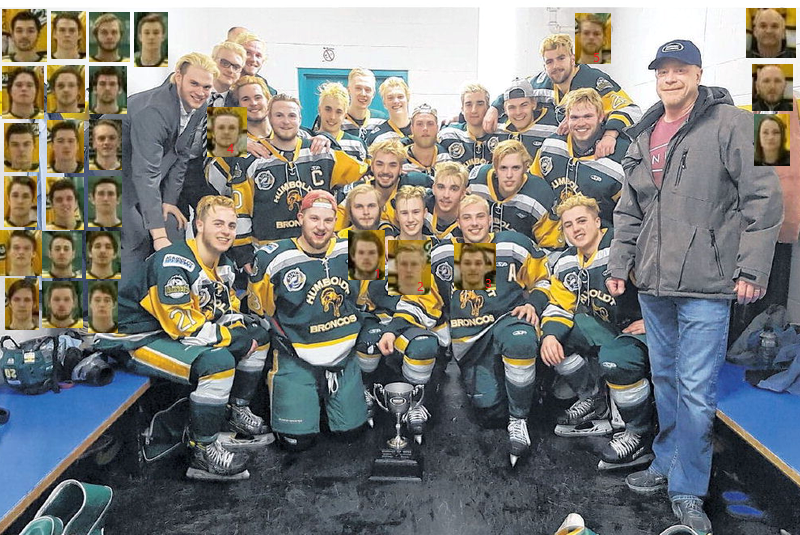 I took a few minutes in Paint and cut the faces from the main team photo and pasted them on the championship photo. The team colored their hair blonde so that makes it harder to see but as far as I can tell these people in the two photos are not the same. The team photo is really bad and hard to see details but I could only find five faces that looked remotely the same to me and that is a stretch. Also, the coach must have changed too because the coaches don't match. I would expect for a small town (Wikipedia says 5869) that there should be a lot of consistency with the people, players, and coaches. "Sixteen of the 29 people on board the bus died — the driver, general manager/head coach, assistant coach, radio commentator, a volunteer, the club's female trainer, and 10 players between the ages of 16 and 21. Fourteen players were injured, several of them seriously." Its hard to see but I pasted in the photos of those I thought were similar under or next to their face. I put a little number on the photo of five I thought were similar but now that I look again not really convinced. The ones I could not place I pasted on the sides of the photo. There are definitely players in the championship photo that are not in the team photo. The more I look I think these are different teams, or mostly so. Thank you for putting together that comparison. I did notice a couple other matches but I was also left with the general impression that these pictures are not of the same team. With any hockey season, my guess is there would be a little movement (1-2 guys) at most. 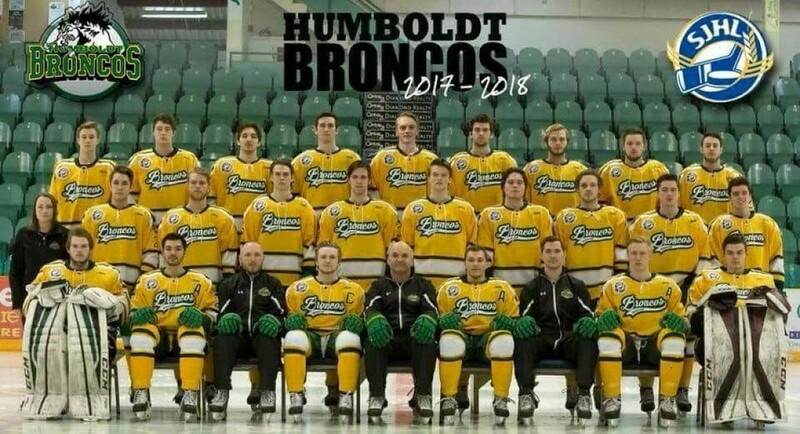 The other thing that jumped out to me was the fact that in the official team photo the players look like young men vs older boys in the dressing room photo. Top 5 GoFundMe Campaigns as at May 14, 2018. Are the 5 matching faces among those that supposedly died, or were injured, in the crash? It seems like you are on to something with the photo comparison. The "official" report is that 16 of the 29 passengers died, Are those 5 that are matching photos among the supposed victims, or survivors? The long necks in this picture are really bothering me. 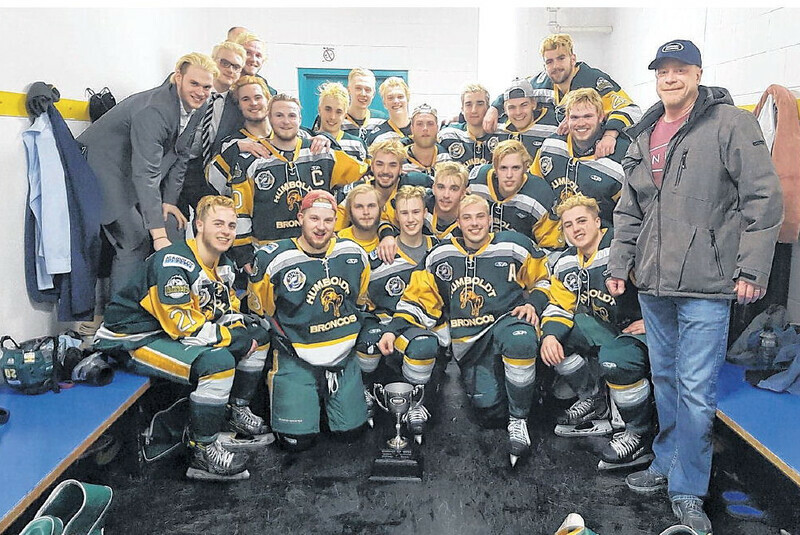 Jaskirat Singh Sidhu, the truck driver who crashed into the Humboldt Hockey Team Bus has gone straight to jail, did not pass go by pleading guilty to 29 charges (16 counts of dangerous driver causing death and 13 counts of dangerous driving causing bodily harm), very nice of him considering that it was a simple mistake of running a stop sign, there was no alcohol or cellphone use to blame. Mark Brayford, lawyer for Mr. Sidhu was a little nervous reading his statement to the media. We recently took over the ah defence of Mr. Sidhu's um case. And ah, I asked him what his position was, and ah his position to me was "I just want to plead guilty, uh I don't want you to plea bargain, I don't want a trial". Mr. Sidhu advised me "I don't want to make things any worse, I can't make things any better but I certainly don't want to make them worse by having a trial." I'm pretty sure any real lawyer would look at this and wonder WTF? Unfortunately I'm unable to embed the video. BTW, I have never seen a Indian truck driver that looks as clean cut as Mr. Sidhu. I guess we're getting Bollywood actors too now.